DAPRA released a video of the LS3 Alpha Dog as it conquers a woody hillside. More intensive testing is to begin this summer. First there were porters, then beasts of burden, then mechanized vehicles. And now we’re back to beasts of burden – and I mean beast! Yesterday Boston Dymanics took their Alpha Dog for a walk in the woods. After putting the LS3 prototype through the rigors of warehouse testing, like trying to kick it over with all their might, they decided it was ready for a real terrain test. The Army considers physical overburden one of its top five science and technology challenges. Soldiers in the field can end up carrying gear weighing 100 lbs and the physical strain takes its toll. 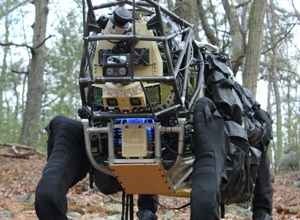 The LS3 (Legged Squad Support System) Alpha Dog is DARPA’s solution to lightening the solder’s load. But more than just navigating rugged terrain, yesterday’s demonstration tested the robot’s ability to follow a person using its “eyes,” a set of sensors that enable it to distinguish between trees or other obstructions and humans. You can actually see in the video that it follows the leader pretty well. With the strength to shoulder up to 400 lbs, the Alpha Dog will definitely be a soldier’s best friend. It also serves as a mobile power source that troops can use to recharge batteries for radios and other devices. It is still quite loud, however, so sneaking up on the enemy with Alpha Dog trailing probably wouldn’t be very smart. This summer, DARPA and Boston Dynamics will begin an 18 month test period during which they will sharpen Alpha Dog’s capabilities. Its vision will be fine-tuned to follow individuals or designated objects and its ability to autonomously navigate over and around terrain obstacles will be evaluated. One planned test will see if Alpha Dog can complete a 20-mile trek while loaded with 400 lbs and without refueling. In addition to improving its vision, hearing technology will be added so that it can respond to commands like “stop,” “sit” or “come here.” At the end of testing, the robot will be given a chance to work with real Marines as they carry out field exercises. After watching the video, I’m pretty confident Alpha Dog will be ready.